The article appeared first in Steven' Window, The National newspaper. Friday 6th November 2009. 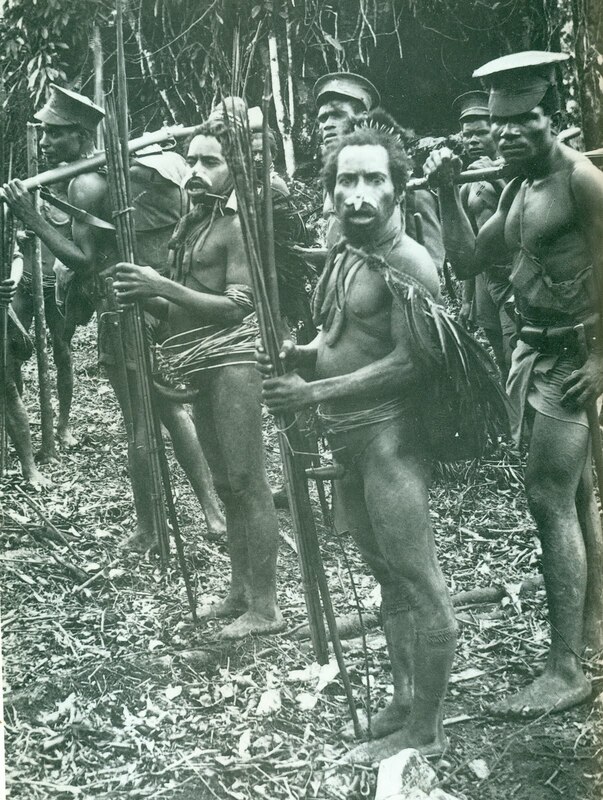 Image courtesy of Bill Gammage, The Sky Travellers: Journeys into New Guinea 1938-1939: 92. Orengia or Holonia in front, facing camera. I read Ignatius Kilage’s semi-autobiographical novel, My Mother Calls Me Yaltep (1980) many times since its publiction. The book was first published by the Institute of Papua New Guinea Studies in 1980, and later republished by the Oxford University Press. It remains a classic PNG semi-autobiography. I read the book as a grade 12 student without knowing that I would end up writing a chapter of my Masters thesis on this book nine years later. The story of Yaltep inspired me to think about writing historical fiction. Kilage wrote the book based on the perspective of a Kuman language speaker in the Simbu province. The book centres on the historical events of 1930s and onward to 1975. Through Kilage’s novel I came to appreciate the importance of writing our people’s experiences and from within our own perspectives. The Australian government officials and American prospectors, and missionaries such as Jim Taylor, Dan and Mick Leahy, Walliam Ward, John Black, Pat Walsh, and Father William Ross had their account of the early contact already documented in many books. We have read books and seen films about their experiences, but have not seen any books on or by Papua New Guineans on the first contact experience. A number of writers from the highlands such as Benjamin Umba, Peter Kama Kerpi, Ignatius Kilage, Toby Kagl Waim, Michael Yake Mell, Arnold Muna, Fancis Nii, have written about their societies, but their writings are little known to many people. Inspired by Kilage’s My Mother Calls Me Yaltep I began a writing project of my own. I interviewed my grandfather in the 1980s when he was still alive. He told me his side of the story as a mission boy stationed in Migende Catholic Station between 1933 and 1935. That was the only account of his early life with the Catholic mission based in Alexishafen, from where they walked up through the Bundi pass to set up their station at Migende. I ploughed through official mission histories and books about that period only to disappoint my curiosity. All the mission boys and helpers were nameless characters assisting the missionaries in their work. I told myself that I would write a book about my grandfather and give a name to these nameless mission boys and helpers. My grandfather’s name is Horinya Jilaka, a man I came to admire for being a pioneer family member accompanying the missionaries into the highlands between 1933 and 1935. It took me some years to write my grandfather’s story down. I had this story published in 2007 as “Into the Frontier”, in the American Journal of Indigenous Literatures, Art, and Thought, put out by the Southwest Minnesota State University. In the process of writing my grandfather’s story I began to uncover interesting developments in his life. In 1936, he (going by the name Orienga) joined the police force and trained in Rabaul under Sargeant Ludwig Somare and another Sargeant from Buka. Jim Taylor hand picked my grandfather’s cohort to accompany him, John Black and Pat Walsh on the now famous Hagen Sepik Patrol of 1938-1939. From a one page manuscript transcribed from my grandfather’s oral account, I began the process of reading written documents and books to get a picture of his place in history. My writing project has taken me so many years to write. I had help from Australian colleagues like Chris Ballard of ANU and writer Drusilla Modjeska. Chris sent me materials on Wiliam Ward, the American gold prospector whose plane was used for cargo and supplies drop off in various camps, and also about Jim Taylor and John Black. Drusilla brought a copy of Bill Gammage’s book The Sky Travellers. I began reading this book, devouring every detail as I went through the pages quickly. What I read enlightened me, but also shocked me to know what my grandfather was like as a policeman. Jim Taylor and John Black approached the New Guinea experience in different ways, but policemen were at most times power unto themselves. The policemen did what they did to protect the Kiaps, even if today we judge them to be violent and reckless. In My Gun, My Brother, August Kituai’s study of policemen during this period, we know that the gun was a policemen’s brother and trusting other policemen, kiaps, carriers, and new tribes was a hard thing to go by. In The Sky Travellers I came across a black and white photograph of my grandfather Horinya (Orienga). The photograph was the only image any members of my family have of Horinya. I noted also that many other photographs of my grandfather are kept in John Black’s private paper collections. My grandfather accompanied John Black after Taylor split from them to travel through Hagen and Enga to get to Telefomin. John Black’s patrol went into the Tari, reaching Strickland, and working their way up to Oksapmin and later Telefomin. Their team reached their destiny before Taylor arrived with his party. John Black’s team built the Telefomin airstrip, a cruelling experience itself, until Townsend from Wewak sent a plane into relieve and rejuvenate them. The airstrip was later to serve as a strategic military airstrip for the Allied Forces during the Second World War. John Black’s patrol left Telefomin soon after the arrival of Taylor’s patrol, making their way down to the Sepik, and later sneaking into Enga to get over to Hagen. My grandfather’s story continues where the history books ended. He joined the coastwatchers soon after they left the highlands. This phase of his life seems lost in history books again. The important issue to me is that as a descendent of a pioneer Papua New Guinean I feel compelled to write about my grandfather and others who gave their life and loyalty to the colonial government. I want to give a name, a voice, and history to people like my grandfather who remain nameless and unworthy of mention in history books. We must write from within our perspectives in order to reclaim our erased identities.